The World Bank: a human rights-free zone? The existing approach taken by the World Bank to human rights is incoherent, counterproductive and unsustainable. It is based on an out-dated legal analysis and shaped by deep misperceptions of what a human rights policy would require. In its operational policies in particular, the Bank treats human rights more like an infectious disease than universal values and obligations. For most purposes, the World Bank is a human rights-free zone. These are harsh words, but unfortunately they are warranted. The World Bank matters. When it comes to eliminating extreme poverty, it is arguably the single most important international agency. Eliminating extreme poverty is one of its two central goals, and its research is more voluminous and influential than that of its peers. It remains the key standard-setter in many areas—its knowledge and expertise are often crucial and its seal of approval frequently encourages the participation of other donors or investors. Based on my careful analysis of the actual practice of the Bank, the following propositions seem to encapsulate its approach: (a) pay lip service to human rights in official settings, as long as there are no consequences; (b) acknowledge the theoretical significance of human rights in studies and analyses of issues in relation to which they are incontestably relevant; (c) ensure that, as a general rule, the Bank does not engage with any aspect of human rights in its actual operations and lending; and (d) be prepared to make exceptions when political imperatives require it, even if that leads to a high degree of inconsistency. The legal approach of the World Bank to human rights is based on double standards. On the one hand, successive General Counsels (the Bank’s senior legal adviser) have found convincing rationales to allow the Bank’s management to work on issues as diverse as corruption, money laundering, terrorist financing, governance and the rule of law. On the other hand, human rights remains on a very short blacklist—along with support for the military and intelligence services—as issues that are currently classified as being predominantly “political” and thus, under the Bank’s founding document, prohibited. Reinforcing this double standard, the Bank has made numerous public statements since the 1990s affirming the importance of human rights. It has often observed that human rights and development are interrelated, and it has insisted that its projects contribute to the fulfilment of economic, social and cultural rights. Those claims, however, are usually made in the abstract, without detailed analysis or any supporting evidence. 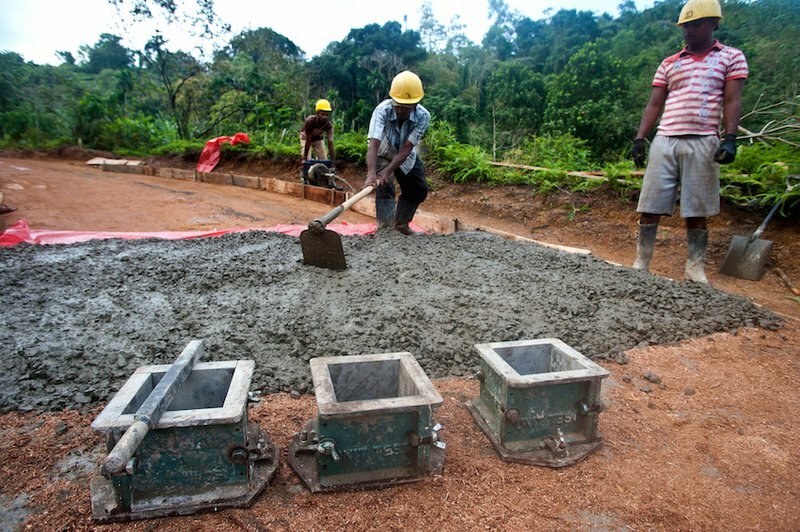 A World Bank funded road-building project in Sri Lanka. . Nonetheless, there are some Bank studies that do enter into detail on the issue of human rights. In 2006, the World Development Report urged that equity should be a central concern in the design and implementation of development policy. In 2011, the message was that strengthening legitimate institutions and governance to provide security, justice and jobs for citizens is crucial to breaking cycles of violence in fragile countries. Despite these and other powerful arguments, Bank-financed projects and programmes go to great lengths to avoid any operational references to human rights. My analysis, reflected in a recent report, of gender-based violence projects approved between 2012-2015 revealed that none of the relevant documents engaged substantively with the human rights dimensions of gender-based violence. The systematic avoidance of human rights language, frameworks and institutions in the context of Bank projects on gender-based violence is replicated in most other areas of its activities, with a few rare exceptions. Even in comparison with other multilateral development banks (MDBs), the World Bank is still an outlier. A recent Bank study concluded that “[m]ost of the other MDBs refer to ‘human rights’ in supportive aspirational terms while recognizing the responsibility of clients to respect human rights.” The World Bank, it noted, does so solely in relation to indigenous peoples. Thus, while the World Bank was in good company in the 1980s, it now stands almost alone—along with the International Monetary Fund—in insisting that human rights are matters of politics. It is long past due for the Bank to bring its operational policies into line with mainstream development theory, especially its own. The biggest single obstacle to moving towards an appropriate approach is the anachronistic and inconsistent interpretation of the “political prohibition” contained in its Articles of Agreement, which were adopted in 1945. The Bank argues that this clause does not allow it to interfere in states’ political affairs and thus effectively prohibits the Bank from engaging with issues of human rights. As a result, the Bank will not engage meaningfully with the international human rights framework, nor will it assist its member countries in complying with their own human rights obligations. But these Articles were written more than 70 years ago, when there was no international catalogue of human rights, no specific treaty obligations upon states, and not a single international institution addressing these issues. The world has changed. A key question, then, is whether it actually matters if the Bank uses the language of human rights or opts instead for surrogates, which are perceived to be less politically loaded or contentious. After all, if it advocates for gender equality, does it really matter if it uses the language of human rights, or whether any reference is made to United Nations standards or the work of bodies such as the Committee on the Elimination of Discrimination against Women? The use of a human rights framework makes an enormous difference, which is of course precisely why the Bank is so resistant to using it. It does matter. The use of a human rights framework makes an enormous difference, which is of course precisely why the Bank is so resistant to using it. Human rights provides a context and a detailed and balanced framework; it invokes the specific legal obligations that states have agreed upon in various human rights treaties; it emphasizes that certain values are non-negotiable; it brings a degree of normative certainty; and it brings into the discussion the carefully negotiated elaborations of the meaning of specific rights that have emerged from decades of reflection, discussion and adjudication. Even more importantly, the language of rights recognizes the dignity and agency of all individuals (regardless of race, gender, social status, age, disability or any other distinguishing factor) and it is intentionally empowering. One of the most striking aspects of the relationship between the World Bank and human rights is how little thought has been given to what a human rights policy might look like in practice. As a result, the prospect has assumed a bogeyman status and Bank officials regularly suggest that if there were such a policy in place, truly draconian consequences would follow. While it might be argued that such fears reflect either fear mongering or a lack of understanding, or both, the real problem is that there has been nothing even vaguely resembling a blueprint on the table. There are certainly hard questions to be addressed. The legitimate concerns of governments, Bank staff and other stakeholders need to be fully discussed. Diverse civil society actors need to think about what exactly they would like to see from a human rights initiative in a more systematic and nuanced way. It is also debatable whether some of the roles that the Bank has been called upon to undertake in the past are appropriate. The starting point for any policy, of course, is to acknowledge that human rights actually are relevant to the twin goals of the Bank. What is needed now is a transparent dialogue designed to generate a policy that will avoid undoubted perils, while enabling the Bank and its members to make constructive and productive use of the universally accepted human rights framework. An inconsistent, ad hoc and opaque policy of the type that exists today is in no one’s interests.